We finally did it: we played Gears of War: The Board Game! Last year, Jorge and I discussed the game in a podcast about the general relationship between board games and video games. Being fans of Gears and games in general, we decided (for better or worse!) we would play it once it was released. We finally did so and now we've regrouped to offer our thoughts on the game and its relationship to its source material. As always, feel free to jump into the comments with your thoughts. - For those who played the game: did you like it? What worked and what didn't? 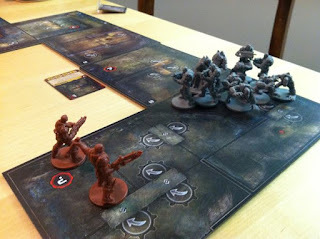 - It was somewhat surprising that the Gears board game felt very faithful to the video game. What are some video games might lend themselves to board game adaptations in a similarly counter-intuitive way? - What lessons can video games take from their more tangible brethren?